Home > How To Guide > Common Problems & Solutions. SOLUTION: restring (all the cords) will likely solve your problem. 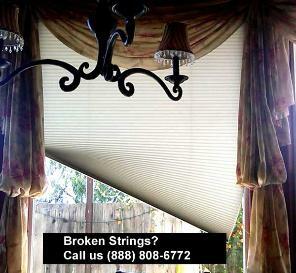 Don't cut corner, you must replace all cords (including non-broken cords), or your blinds may not work perfectly. Make sure you check cord guides. If there're signs of deep wear, they must be replaced or your new cords will be cut prematurely. SOLUTION: replace cord lock. Your cordlock may also be worn out and either becomes too dull (can't lock the cords tight any more), OR too sharp (will cut/abrase your new cords prematurely). SOLUTION: repair or replace the ladder cords. Ladder cords attached to the tape rolls (inside headrail) may be broken. Causing your slats to sag & blind inoperable. SOLUTION: replace drums. Tape rolls or drum may be broken, causing the ladder cords to fell off. So your slats sag & blind can't raise nor tilt. If the shades slowly sliding down, your lock is worn out. SOLUTIONS: replace cord lock. the carriers arms may be broken. SOLUTION: replace the bad carrier arms/connectors. The carriers may be broken. SOLUTION: replace plastic gliding carriers & possibly master draw carrier. SOLUTION: check the tension. Either add new tension screws, or add repair louver pins + tension pins in between louvers & stiles. SOLUTION: remove the broken cuff link, connectors. Replace with new connectors. What are your blinds problems? Tensioner. Carriers & wheels are broken/missing. clamps onto the string at the same spot, which causes the string to wear through and then break. Be sure to lubricate your tilt gears and vertical track with silicone occasionally.